Italian painter (also Sammacchini or Sammachini). Although a pupil of Pellegrino Tibaldi, his early work mainly reflects the classicism of Raphael as interpreted by Bagnacavallo and the Mannerism of Innocenzo da Imola and Prospero Fontana. Simplicity of form, limpid colours and purity of line characterize such early works as the Marriage of the Virgin (c. 1555-60; Bologna, S Giuseppe). Also datable to this early period is the Mystic Marriage of St Catherine (Bologna, private collection), which unites the style and typological elements of Fontana with a highly refined use of colour reminiscent of early 16th-century south Netherlandish painting. In 1563 Samacchini participated in the decoration of the Belvedere and the Sala Regia in the Vatican. This Roman experience resulted in works characterized by complicated compositional solutions and spaces teeming with lively, clearly articulated figures. The influence of Michelangelo can be seen in the Crucifixion (1568; Bologna, S Maria dei Servi) and in frescoes depicting the Brazen Serpent and Moses Striking the Rock (1570-77) in Parma Cathedral. The influence of Federico Zuccaro appears in the fresco of Paolo Vitelli Driving the Venetian Army from the Casentino (c. 1574) in the Palazzo Vitelli a Sant Egidio, Citta di Castello, while the Presentation in the Temple (1575; Bologna, S Giacomo Maggiore) reflects the late work of Vasari. Certain features of the school of Parma, however, can be traced as early as 1569, for example in the Transfiguration (Bologna, Corpus Domini), which shows the influence of Parmigianino, and in the later frescoes of Virtues, Prophets and Angels in S Abbondio, Cremona, which include suggestions of Correggio. A more discreet Mannerism characterizes his last altarpiece, which depicts the Virgin and Child with Saints (1576-77; Bologna, S Maria Maggiore). 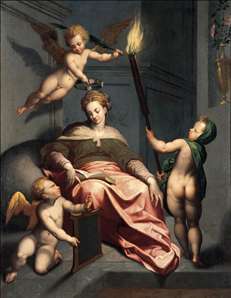 See more details about "Allegory of Wisdom"